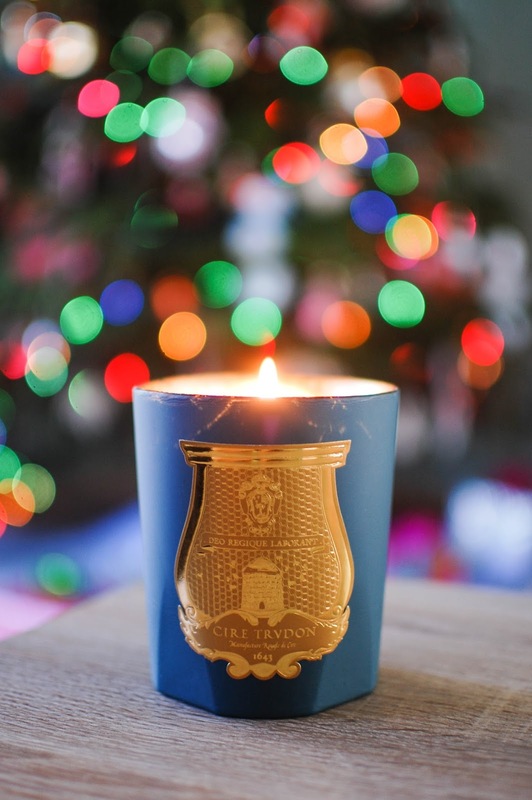 This candle is from the Cire Trudon holiday release two years ago. I bought it post-Christmas at the Oxford Exchange in Tampa, normally $105 I believe, but marked down to $60. 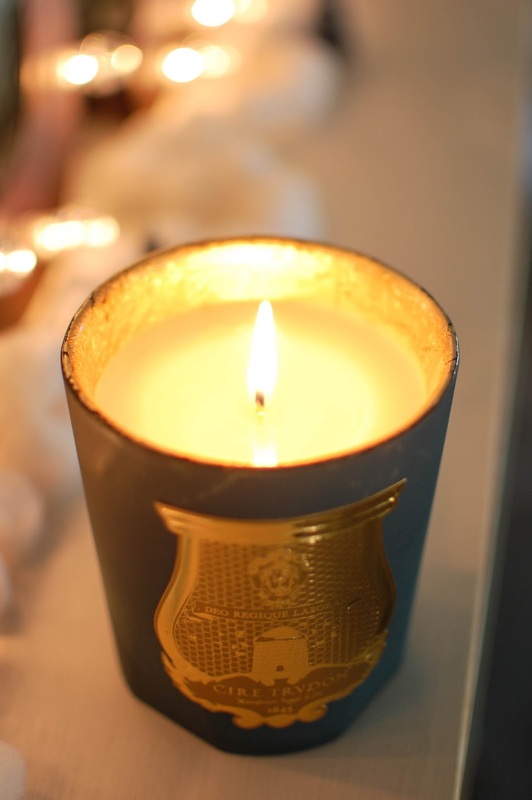 Cire Trudon is touted as being the oldest candle maker in the world. Founded in 1643, Cire Trudon graced the courts of Louis XIV (the Sun King) and even gained the approval of Marie Antoinette and then at a later date, Napoleon. Using 100% vegetable wax poured into hand crafted Venetian glass vessels, this candle brand is a highly indulgent treat. Gabriel- Notes: Birchwood, sugared chestnuts, cashmere wood, moss, cedar, musk and patchouli. A soft and sensual medium to small bedroom scent. In the living area I got a medium-light throw but in my bedroom it was perfect. The birch holds a furred cedar tone that glows with vanilla amber illumination. An umber shading of oakmoss and patchouli ground the fragrance but do not take away from the subtle sweetness. On the whole, cashmere woods describes this scent perfectly. I love the gold leaf foiling on the inside, it makes the flame light glow warmly. A splurge of a candle for sure. Cire Trudon crafts wax tarts too. I plan on giving them a test drive at some point this year. Do you have a favorite high end candle? Ooh, what a gorgeous jar - I love that sort of dusky periwinkle and gold together. Beautiful! It is a stunner for sure. The little cracks and gaps in the gold foil allow the light to shine through the jar in the coolest way. I am crushing pretty hard right now. And at this price point that is deadly. The gold and periwinkle is a lovely combo! I would not have guessed that. It fits my home colors too which is a nice perk because I will be keeping this glass long after the wax is gone. Excellent! May I ask what store? Because it is nice to add another place to go when we head up to that neck of the woods :-) The Candle Lab is nice. I need to check back on their site. Nest. Yes. I kept eyeing the Nest Birchwood with my Sephora gift card but I ended up getting the Acqua di Parma fragrance. Capri Blue? Off to Google that one. You threw out your newer wax?! Girl I would have bought that from you. I plan on throwing out clothes, going naked and having wax and candles. LOL! Juuuussssst joshin'. I will throw out my shoes. Go bare foot. Nah I will just stuff it all in my closet, good thing it is a decent size. It's a boutique called Cuffs, has high end clothing, jewelry and fragrance. It's in Chagrin Falls, one of my absolute favorite little quaint shopping towns. They also have a shop there called The Village Herb Shop that's an amazing scented palace as well! Just grabbed some mystery boxes from the Candle Lab, they were so fun to open and guess the scents! Found some new faves, Hyacinth, Bergamot and Nutmeg. Capri Blue (which my phone just autocorrected to Captain Value lol) is sold at Anthropologie, they are the ones that do the famous Volcano scent that a lot of vendors are duping. Definitely didn't throw out new wax!!! Just some old stuff that I've had for ages. Planning on doing a free wax box on the blog soon too! Unless you just want it, of course =) Let me know! My poor neglected old blog! Lol. I need to revive it. I will keep that in mind for our next CLE excursion. I very much enjoy a good bergamot. And nutmeg always wins me over. Anthropologie has some great candles don't they? One day I will actually splurge on some. (I feel that day coming soon). Whew. Good. My hair was about to turn white. REVIVE the BLOG!!! And if you think I would enjoy some scents I am always willing to pay for a Jacqui box.